This summer the Quu’asa program added two new positions to improve how its mental health and cultural services reach young people in Port Alberni. Amelie Duquette and Lisa Forryan began their roles as Quu’asa youth workers on July 23, part of the Nuu-chah-nulth Tribal Council’s Teechuktl Mental Health Services. As Port Alberni is the urban hub for many Nuu-chah-nulth communities, the need arose for more resources to help prevent youth from being lured into “high-risk behaviours,” said Teechuktl Mental Health Services Manager Vina Robinson. The ongoing opioid crisis is a foremost concern for young Nuu-chah-nulth-aht, she said. NTC Director of Health Simon Read has seen a desire in the tribal council to work with youth in a more positive and preventative way. 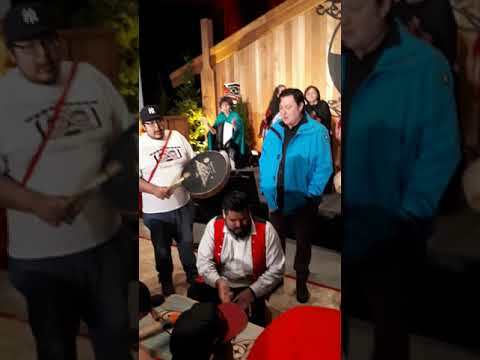 Robinson observed the long-term harm of displacement while speaking with a young Toquaht man living in Nanaimo’s tent city. Both of the youth workers come from outside of Nuu-chah-nulth territory, and cultural learning has become part of their education in taking on the roles. With a degree in child and youth care, Forryan has been focussing on developing comfortable relationships with young people over the last few months. Forryan grew up in Campbell River, and comes into her position with a fresh perspective on both Nuu-chah-nulth culture and Port Alberni. So far she’s found that young people who aren’t on sports teams or in other extracurricular activities offered at local schools struggle finding things to do. Duquette grew up in Shefford, a town east of Montreal, Quebec, and has degrees in criminology and anthropology, with a specialization in First Nations studies. So far she’s relied on teachings from other Quu’asa staff to learn about Nuu-chah-nulth culture, and with this guidance Duquette hopes to bring her new perspective to support young Nuu-chah-nulth people. Duquette’s interests are in outdoor activities, such as rock climbing, camping and canoeing, while Forryan’s hobbies are more craft-oriented, ranging from cedar weaving to Dungeons and Dragons. Duquette finds that connecting with one’s ancestral culture will be a different journey for each individual. “A teacher should learn just as much from their students as the students learn from them,” added Forryan. Amelie Duquette and Lisa Forryan are based at the Teechuktl Mental Health Services office on 3483 Third Avenue in Port Alberni.